Gary Oldman, Ice Cube, Ed Harris and (probably) Sam Worthington are the stars of a hit blockbuster that some estimate has already taken in $650 million dollars. Ordinarily, high-profile Hollywood talent like this is a powerful weapon in the war to win the hearts, minds and dollars of consumers. A movie with this cast wouldn’t hesitate to put them on the front lines of an advertising blitz. However, Oldman et al.’s latest project isn’t a movie, but a video game. Despite the potential to shock and awe with star power, it seems instead that inserting big name celebrities into the game is a covert operation. I don’t have a marketing degree and I’m not a seasoned corporate executive, but it seems strange not to exploit the potential draw of talented, recognizable actors. Perhaps the rationale is that the people planning on buying Black Ops would buy it even if Justin Bieber was playing the lead, while the people not interested in it would need more than movie stars to bring them around. While this argument is somewhat convincing, it still odd strange to go to the trouble of signing big names only to bury them in the credits. Voice work is expensive, even when casting unknown actors, so why err on the (pricey) side of celebrity when anonymity will do? It’s a problem that stems from Black Ops’ split identity. Its single player campaign strives for a mixture of Bruckheimer-esque action and Coppola-inspired social commentary but never wholly succeeds. While it delivers in terms of imposing set pieces and blinding explosions, its plot feels more like pulpy than poignant. Black Ops is a Cold War genre piece that treads on familiar ground: A team of special agents travel the globe, fighting secret wars, hunting Russians and Nazis, all the while searching for brainwashed sleeper agents. The story itself doesn’t have a unique personality, but sometimes strong actors can save a weak plot. Unfortunately, movie stars are only as good as their lines and Black Ops doesn’t give them much to work with. Standard war-movie cliches (“We’re at Defcon 2!” and “It’s ‘Nam baby!” etc.) don’t tell us anything other than what is happening in the scene, something that is communicated more effectively by the game’s striking visual style. Oldman in particular seems to work hard to give Reznov some personality, but his chops are mainly used for chewing the scenery. Sam Worthington’s (alleged) performance as Alex Mason vacillates between anguished screams and gruff tough-guy talk. Much of it comes across with a distinctly “down-under” vibe, which raises two questions: “Why not hire an American to play an Alaskan?” and “Why not do another take?” Ice Cube is entertaining, but it’s disappointing to see him relegated to one-liners, as he has demonstrated that he can excel in a war story. 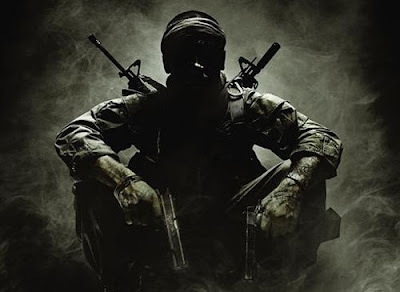 However, these problems are largely rendered moot: For many, Black Ops’ identity as an authored, solo experience will be dwarfed by its identity as a multiplayer experience. It’s here that the rationale for downplaying the cult of celebrity begins to make sense. More than anything, Black Ops is a role-playing game in which players take center stage. This trailer is an inventive, sincere portrayal of why people stick with the Call of Duty franchise: It can make anyone, from any walk of life, an action hero. Based on the marketing and the obvious work that went into the Black Ops multiplayer, Treyarch and Activision seem well aware of the game’s strengths. So as not to subvert its strangely democratic nature, the game must avoid becoming too focused on charismatic leading men, even as it yearns to sit alongside the great war stories found in other media. Attempting to insert movie stars into Black Ops threatens to detract from the real star, the player, and so it must be done stealthily. * this creates a nice precedent for everyone, not just Activision to say "your name adds next to nothing to our sales - just look at Black Ops"
Hey Kenny, thanks for stopping by! Interesting points that, if true, raise even more questions! The voice acting, while competent, isn't really anything special. I can only assume that hiring even somewhat-notable Equity actors would have produced the same results at a fraction of the price while also significantly simplifying the complicated negotiations that come with big stars. Corporate decision-making never ceases to amuse and befuddle.